Heat oven to 350°F. In large bowl, stir peanut butter, coconut oil, brown sugar and granulated sugar until well mixed. Stir in applesauce, flaxseed and vanilla until smooth. Add flour, baking soda and salt; mix well. Stir in oats, chocolate chips, raisins and peanuts. Drop dough onto ungreased cookie sheets by packed level 1/4-cupfuls. Press down slightly. Bake 9 to 11 minutes or until edges are golden brown and tops of cookies are set. Cool 5 minutes on cookie sheet. Carefully remove to cooling racks; cool completely, about 30 minutes. Store loosely covered at room temperature. Cooking Vegan? Always read labels to make sure each recipe ingredient is vegan. If unsure about any ingredient or product, check with the manufacturer. Look for vegan chocolate chips in the health food section of your grocery store. They may also be labeled as dairy and gluten free. If your coconut oil has solidified, simply place the jar in a bowl of hot water. We used refined coconut oil for its neutral flavor, but if you love the flavor of coconut in your cookies, use virgin coconut oil. 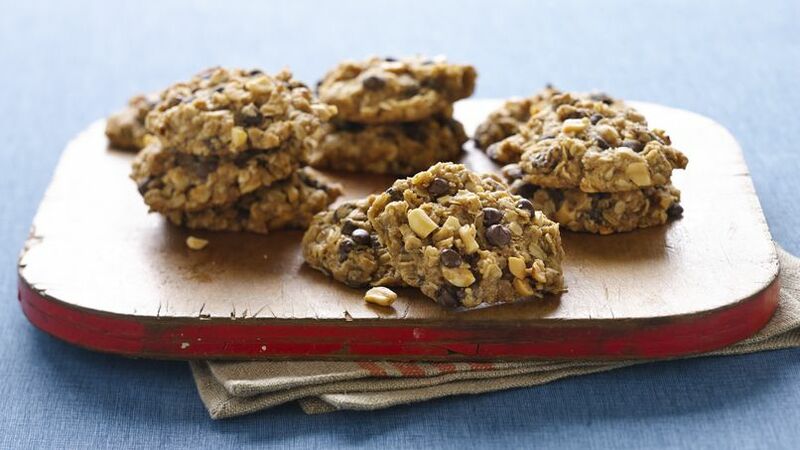 Inspired by the popular monster cookies, these vegan treats are packed with goodies like oats, raisins, peanuts, chocolate and more.